The LA Beer Fest. This weekend. For free. 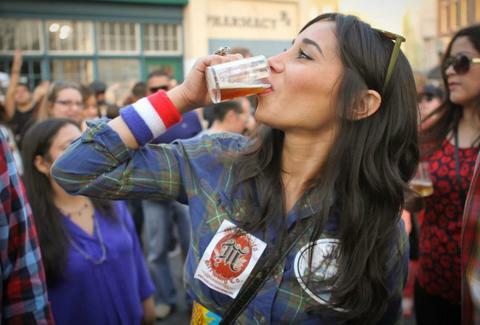 This Saturday is the annual LA Beer Fest; an all-you-can-imbibe bacchanalia w/ dozens of breweries giving out unlimited pours of their finest suds, plus a schload of LA's best food trucks, and of course some pretty spectacular people-watching to boot. There're two sold-out sessions, and -- thanks to Eventbrite -- we've got two free tickets for one lucky winner to go to the first (from 12-3pm), which, in addition to all the awesome above, also includes music from the indie-rock tribute band Black Crystal Wolf Kids, which is really the (Black) Key to the whole thing. We gave away tickets, but the winner's already been picked! Jeff Miller is the Editor of Thrillist LA and, um, full disclosure, is the lead guitarist for Black Crystal Wolf Kids. He can be found at @thrillistla on Twitter.